The Sputtlefish (カワスミ?, lit. : "River Cuttlefish") is a squid-like enemy with a flower-like protrusion atop its head, found in Pikmin 3. These enemies can only be found underwater. They swim casually when not threatened, but upon the arrival of Pikmin, they will take an upright posture and swim towards them. They can lash out on Pikmin with their tentacles, grabbing and eating them one at a time. If attacked, one will release ink which causes Pikmin to panic for some time until they are whistled and swim away. The Sputtlefish can also gradually heal if left alone once attacked. Sputtlefish are generally passive creatures, attacking only when Pikmin are nearby. If the player doesn't bother it, it won't bother them. They are overall very simple creatures with a quick but predictable lash attack, capable of snatching only one Pikmin at a time, and they eat relatively slowly. When in danger, however, a Sputtlefish may release a cloud of ink, scattering any attacking Pikmin and propelling itself away from the fight. When it is not actively focusing on a prey, it will slowly regenerate health while idling. It can fully regenerate in 60 seconds. A Sputtlefish can easily be defeated with six or seven Blue Pikmin. If all of them are able to latch onto the creature at the same time (they should all be preferably flowered), then it will be dead before it can release ink, which acts like non-deadly poison. If the creature is given the chance to ink, whistle them back to avoid any incident. Alternatively, the Pikmin can be left alone, and the ink will gradually wear off. This is not recommended, as it is a waste of time as well as a chance for Pikmin to get eaten by the fish (though unlikely). When it does ink, it might move around a bit, so chasing it may be necessary at times. If you come across a group of Sputtlefish, the strategy stays mostly the same; send 5-10 Pikmin onto each, and they won't be able to do much to help each other. If a Pikmin does get caught, you will likely be unable to save it if the creature is at full health, so it is always best to strike first. If time is a concern, you can easily leave a small group of Blue Pikmin to attack a Sputtlefish, then go off and do something else that needs to be done, and the Pikmin should be able to take the creature down without any trouble. Its name is based off of "spurt" – since it squirts ink to defend itself – and cuttlefish, a real-life animal that it resembles. A cuttlefish has two tentacles and a soft body, much like the Sputtlefish. The "sputtle" part of the name could also be based off of the real life sputtle, an excretion produced by insects that functions as a paralytic defense. In Japan, it's known as カワスミ?, in which カワ? means "river" and スミ? is short for スミイカ?, which is the word for the golden cuttlefish, or the Japanese spineless cuttlefish. The creature's internal name, kawasumi, matches its Japanese name. A close up shot of a single Sputtlefish. Two Sputtlefish and a Waddlepus in the Garden of Hope. E3 2012 screenshot of Blue Pikmin fighting a Sputtlefish. E3 2012 screenshot of a Sputtlefish attacking Blue Pikmin with ink. 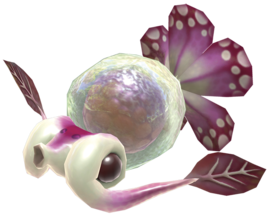 The Sputtlefish's tentacle ends resemble leaves, and the top of its head resembles a flower, which are traits of Pikmin. This page was last edited on February 4, 2019, at 12:27.